As the G20 summit in Toronto draws closer, and the fences go up, anger continues to boil in Canada's largest city about the $1 billion dollars which the state has spent on security. Amongst the large police arsenal which could be deployed against protestors at the G20 is the much feared Long Range Accoustic Device (LRAD), which many call "sound cannons". 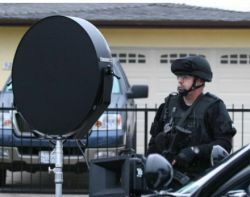 LRAD's have been used by police in protest situations to emit an extremely loud, high-pitch tone in order to disperse crowds. Many fear that this device could cause long-term hearing damage. However, we spoke with two people who have much experience with the LRAD, who both attest that the LRAD may not be as effective as the police would like the public and protestors to believe. Alex Bradley is a member of the Pittsburgh Organizing Group, and experienced the LRAD when it was used by the police against protestors at the G20 summit in Pittsburgh in September, 2009. Robert Putnam is in in charge of investor and media relations for the LRAD company, which manufactures and distributes the LRAD out of San Diego.